The stream of success continues to flow. Since its premier on October 10, 2012 at the prestigious and packed Science City, Kolkata, India, “Swamiji” laser show has been displayed in dozens of cities in India and the USA, including Kolkata, Narendrapur, Salt Lake, Howrah, Deoghar, Delhi, Baroda (Vadodara), Ahmedabad, Rajkot, Bangalore, Mysore, Pune, Mumbai, Belur, etc. in India, and Denver, Houston, Atlanta, Cleveland, Columbus, New York, Boston, Chicago, Detroit, San Francisco, Sacramento, Seattle, Raleigh, Hockessin (Delaware), etc. in the USA. Due to popular demand, at several cities the show was displayed multiple times in India, where it was also internationally telecast by ABP Ananda News Channel of Kolkata. In the U.S., Sorcar was interviewed by several radio and TV stations including NPR, WUNC News Radio in Raleigh, Geetanjali Radio and Open Forum in Houston, The Foundations TV in Boston, and TV Asia at several cities. “It was a nice experience for the spectators of different countries round about fifteen thousand in number, to enjoy such a grand Laser Show about Swamiji’s life in the Belur Math complex where Swamiji’s presence is still realized….the projection of the life of Swami Vivekananda by the Laser Show is a unique thinking for spreading the ideals of Swamiji. In that perspective Mr. Manick Sorcar has done really a praiseworthy performance having merit of distinction”. "Manick Sorcar at His Best – Laser Documentary on Swami Vivekananda … The sixth annual fundraiser of Sewa International held at the Stafford Center on Sept 8 was a resounding success being a totally sold out event thanks to the featured attraction, Manick Sorcar’s one of-a-kind unique laser documentary on the life of Swami Vivekananda….The audience was spellbound and proved to be very emotional for several and the Houston crowd honored him with a standing ovation”. "...The life of Swami Vivekananda came alive through a first-of-its-kind documentary made in laser by US-based artist Manick Sorcar on the philosopher-saint's 150th birth anniversary". 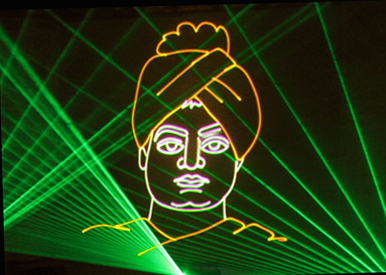 "Lavish laser show throws light on Swami Vivekananda. A pencil torch emitting laser light turned into a magic wand and the magic of light brought to life the evergreen story of a world famous monk, known as Swami Vivekananda. The expectant audience, unfamiliar with the technique of laser show, was perhaps looking for a miracle and miracle, indeed, occurred as ships sailed, trains arrived, men and women walked and children played, all walks of life continued, bound and shaped by sheer light… The art of cartoon and animation reached its zenith in the hands of the reputed Laserist Manick Sorcar”. “Apart from the very impressive display of laser technique, what really gladdened our hearts was the accuracy, authenticity and the appropriate nature of the choice of incidents, music, narration, etc….It gives a wonderful glimpse of his work in the West as well as in India. It highlights some of the most important and soul-stirring messages of Swamiji. In our view the Western audience would appreciate the show even more because Swami Vivekananda’s message of harmony has been beautifully highlighted”. "...I would also like to thank you wholeheartedly for the excellent laser show on our beloved Swami Vivekananda that you staged on November 24th at Auburn Performing Arts Center in greater Seattle area. Your presentation of Swamiji's life in the show was factually and artistically perfect." “..The show was much appreciated by viewers at Pune…Audience was spellbound while watching the show. Incidents for the life of Swami Vivekananda presented were carefully chosen to propagate message, and were faithful to the literature published by Ramakrishna Math and Ramakrishna Mission”. "The main attraction of the show was the episodes of Swamiji's tour to Indian subcontinent extensively where he acquired first-hand knowledge of the condition prevailing in British India and later his voyage to west provided interesting viewing for the houseful audience who sat spellbound, eyes popping out as they watched the color laser beams fly overhead with fast pace complemented by electrifying music synchronized with intelligent lighting, sound surround system, narration, enactment, and visual effects on screen. The life and journey of the great Hindu sage, Swami Vivekananda has been conceived as an educational, entertaining and magical experience". “In this world every work is destined for specific people, for specific time. You were destined to spread the message of our beloved leader Swami Vivekananda through your laser magic. Swami Vivekananda has selected you to spread his message through the modern technology that appeals to and attracts our youth”.